We at Sprout Apps strive to make translating Sprout Invoices (and all other apps) easy to translate and use your own translation files. This guide will help you through the process and get you using Sprout Invoices in your language. First thing to do is set the language of your WordPress install to the language you prefer. Most likely you've already done this when installing WP; if not, then adjust the language on the Settings page. 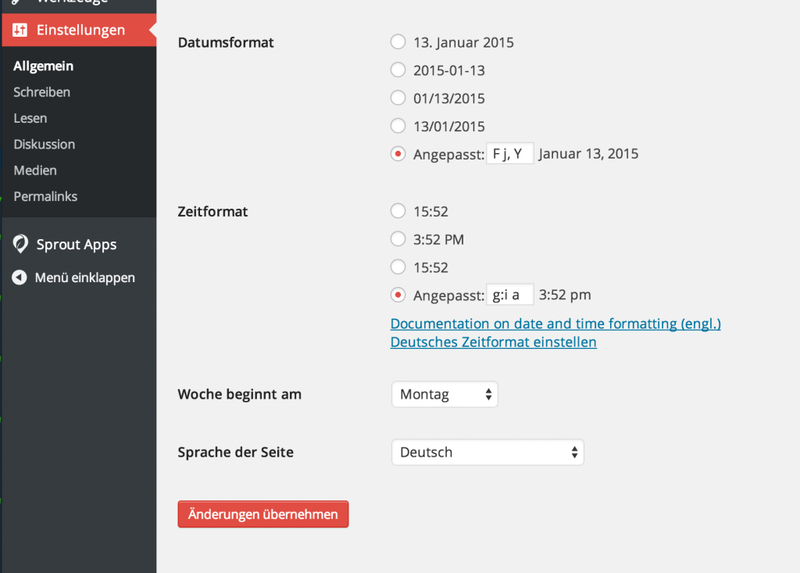 Create new folder called sprout-apps inside of wp-content/languages/. If languages/ doesn’t exist, create it as well. Translating is now made a lot easier with WordPress.org. Tutorials and tools can be found on the Sprout Invoices translation project. Sprout Invoices comes with a limited but growing set of languages, if yours doesn't exist you might want to create your own. Don't be discouraged, it's relatively easy. POEdit is cross platform tool that is popular among many developers and translators, mainly because it's rather simple to use. A wonderful tutorial on how to use it was published on Pippin’s Plugins, we recommend that article if you need help. Note:To help Sprout Invoices' future, we'd love for you to contribute your translation. We have incentives for those that do contribute too.